Gates is the only manufacturer approved by virtually every major OEM to provide timing belts for new engines. OEMs from North America, Mexico, Brazil, Japan, Europe, Korea and Australia specify Gates. 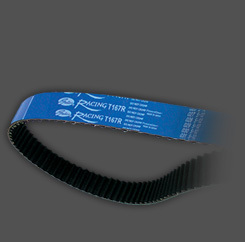 When it comes to producing timing belts for the automotive aftermarket, we take advantage of our manufacturing know-how in OE-belts and technical expertise to produce belts that are equivalent to or even surpass OE standards. This is why we confidently stake the claim that our timing belts are the ‘Original', which is a fact that our competitors cannot accurately state. Every Gates Original timing belt is specifically engineered to meet the rigors of each particular engine to ensure that all our customers receive a product that performs just as well as the original belt that was installed by the vehicle manufacturer. Engine damage caused by using inferior-quality timing belts is costly and potentially disastrous to the reputation of your business which would negate any form of savings incurred. Why settle for the rest when you know you can always provide your customers the best with Gates Original Timing Belts. Designed to handle a wide speed range and constant, synchronous drive power requirement common to overhead camshaft applications. OEM equivalent and profile meets or exceeds OEM performance requirements. Tough, wear resistant fabric on working surfaces. Special materials resist oil and high under-hood temperatures. disastrous to the reputation of your business which would negate any form of savings incurred. Why settle for the rest when you know you can always provide your customers the best with Gates Original Timing Belts.